On the evening of June 12, 1997, a darkened Madison Square Garden was alive with anticipation. Fifteen hundred students and their families, representing a true cross-section of New York City’s public school population, waited in hushed silence for the Council for Unity (CFU) initiation procession to begin. The event that followed was a symbol of the growth and achievements of CFU and its president and founder, Robert DeSena. Over the last 23 years, the CFU has grown from a small group of John Dewey High School students in Brooklyn to a multi-city national youth movement of 3,000. And if Robert De Sena has his way, it won’t stop there. For over two decades, Robert has empowered urban youth, providing them with positive direction and support. The fruit of his labors is an impressive, growing network of young people who have discovered strength in their diversity and a powerful voice in their unity. Robert grew up in Brooklyn gangs and what he calls “the darker side of life.” The suicide of his mentor, who had always tried to convince Robert not to waste his potential on the streets, turned him away from violence and made him determined to make something of his life. He earned a B.A. from St. John’s College and a Master’s degree in English from New York University. His early involvement with gangs left him acutely aware of the struggle with alienation and despair that turns many teenagers to guns and drugs and shaped his commitment to teaching. 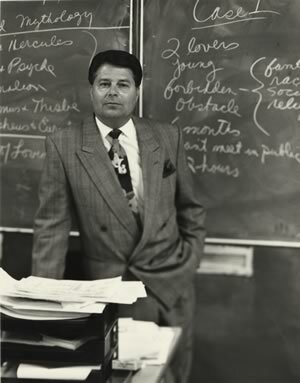 In 1975, as an English teacher at John Dewey High School, Robert brought together the leaders of six gangs to mediate their differences. Through working with the gangs, Robert realized that traditional mediation was “reactive rather than proactive,” and was ineffective at stopping the feelings of fear, frustration, and inadequacy that resulted in violence. Working with his students, he turned this group into the precursor of the CFU—a peer education organization that offered the same sense of loyalty, safety, and togetherness that young people found in gang life. Based on the principles of empowerment, unity, family, and self-esteem, the Council began as a series of classes for students with disciplinary problems. The CFU course became so popular that the school began to offer it as an elective. At first, Robert conducted the class himself, but gradually ownership of the class was turned over to the students. CFU classes became forums for open discussion of experiences, concerns, and fears of the students. As student commitment to the CFU grew, it began to encompass social events, parties, community service activities, and student government. With members in elementary, middle, and high schools in forty New York City school districts, two St. Louis schools, and, by fall 1998, 20 more in New Jersey and Missouri, the CFU has grown rapidly. As the leader of this burgeoning young movement, one of Robert’s challenges lies in remaining connected to the kids while spearheading its institutional growth. Never at a loss for how to build bridges between people, groups, and his own organization, Robert led a group of high school student members of CFU in early 1998 to the New York State Legislature to lobby for funding. Not only did their presentations impress the legislators, who awarded them a $250,000 grant, but it also empowered the students and taught them about government. The Council’s effectiveness with students from widely diverse backgrounds is due to Robert DeSena’s ability to bring people together by illuminating what they share in common. Robert’s energetic leadership and consensus-building skills have made the Council for Unity an inspirational force in the lives of a growing number of urban youths.